The Fairways homes for sale are located in one of the developments of the Highlands. 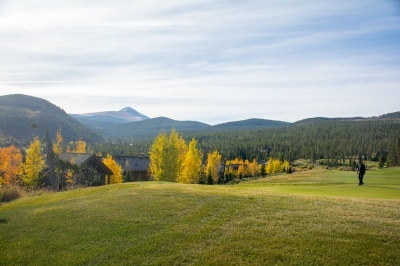 The Fairways is a group of homes near the Breckenridge Golf Clubhouse. Adjacent to the 1st, 3rd, 4th or 6th holes, homes for sale in the Fairways will also be only one-half mile from Hwy 9, closer to Frisco and I-70 than most Breckenridge subdivisions and near the Swan River, backcountry trails and cross country skiing. Learn more about living in this exclusive subdivision, or browse the beautiful Fairways homes for sale below. There is no Fairways property that was built earlier than 1999, and all houses are required to meet architectural design standards required by the homeowners association. No wells or septic systems are allowed in the Highlands, but because this neighborhood is within town boundaries town water and sewer, natural gas and electricity are available. All electrical lines are buried in the Highlands. In the winter, the same land becomes the Gold Run Nordic Center, and miles of groomed track is only a few short glides away from any Fairways home. Hiking and biking trails lead into the backcountry from several points in the Highlands, and just across Tiger Road is the Swan River and quality fishing waters. No commercial lodging or Bed & Breakfast operations are permitted in the Highlands, but the homeowners association expressly permits short-term vacation rentals. Size (sq. ft. liv. area): 3819 sq. ft. to 6989 sq. ft.
HOA: Hawks View Property Management, Kiersten Stais. Amenities: Golf course, cross country skiing, large lots, north side of the Highlands, trails nearby, rivers. 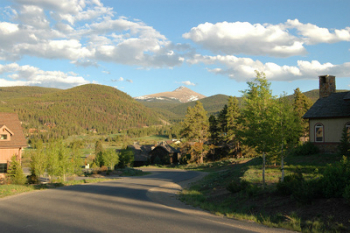 Drive north from downtown Breckenridge, through the traffic circle and continue on Highway 9 north three miles to Tiger Road. Head east on Tiger for one-half mile then turn south (right) on Clubhouse Drive, then right in one-tenth mile onto Highlands Drive. The Fairways homes for sale will be located on this road, or on Fairways which will be the next left turn, or on Glen Eagle Loop, a little farther on, off Fairways. Do you have any questions about the Fairways or Breckenridge real estate? Get in touch with us to talk to an expert, today!